$250 delivery in the continental USA. Ships worldwide for an additional charge. A dance of shapes, this turned wood mirror's lovely contours possess an artistry evoking natural rhythm and stately grace. Its casual elegance brings a refined modern-organic touch to traditional or contemporary spaces, with cracks inherent to the wood only adding to its character. 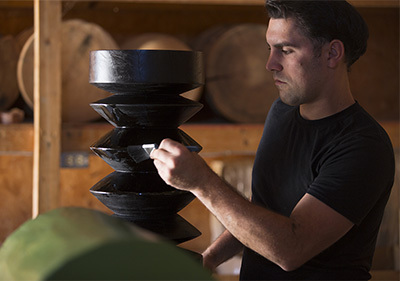 Our artisans turn solid Margosa - a dense tropical wood - on a lathe, shaping and sanding by hand. Your piece will be finished per your specifications.